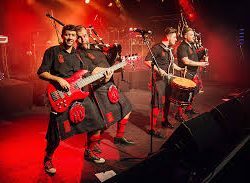 When one of the Red Hot Chilli Pipers gave me an FB-heads-up about his recently released CD, I was like… so, how can I get to hear this? That developed into a few Messenger exchanges, a couple of emails, an encounter with Dropbox and in very short time I was listening to Modern Love Affair on my iTunes account. Yes, this is the 21st century and its ubermodern way of communicating and sharing information. To be fair, I have seen Alan a couple of times in his bass-playing role with the RHCP and I think we even shared a smile when he told me he had seen me waving my little Scottish flag at the show I was at in Nienburg earlier this year. Incidentally if you haven’t come across this group of Scottish bagblawin’- tassleswishin’ – toetappin’ – sporranshooglin’ – kiltswayin’ – coolrockin’ musicians yet, I guarantee they will quite simply, knock you out with their unique blend of what they call, “bag-rock” – the latest ‘Octane’ tour dates are here and I think you’ll find that one show won’t be enough. Modern Love Affair is essentially a don’t-stop-believing, true story of two people dealing with the challenges of a long-distance relationship and in this case, that would be Alan and Calida. In the old days, people would say things like “absence makes the heart grow fonder” or something like that… but these days, most of us have access to Skype, Face-time and an array of communication apps at our fingertips that would render Alexander Graham Bell speechless if he were around to witness the current, smart phone revolution or then again, maybe not…! So in the today’s “big picture”, distance is somewhat relative. While I was listening to the music on Modern Love Affair, I found myself being transported back to my native Scotland as the haunting melodies and lyrics unfolded, reminding me of sounds from the days when a crowd of us would frequent the bars around Loch Lomond in general and Rowardennan in particular, checking out the live music scene that was more or less unplugged back then and featured vocals, harmonies, acoustic guitar, piano, fiddle, heartfelt passion and the occasional bagpipes… to be honest, just like Alan’s CD which presents a collection of tempos ranging from upbeat (Modern Love Affair and Skype Me In The Morning) to melodic (Four Walls, The Distance, Everything Is Gonna Be Alright, Live The Life) to mellow (You’ve Ruined Me, Goodbye and Scotland Fair) and to traditional Scottish folk rock (You Were Meant For Me). Alan kindly took the time to respond to some questions that I eee-ed him as a way of lifting the lid as it were on what really is a musical account of a conversation between two hearts, their hopes, their dreams as well as the closeness that develops – in spite of the distance – as you quite literally carry your feelings around in your pocket. I began by asking Alan to tell me where he was born and where he grew up. Alan: I was born in Bellshill, grew up listening to my brothers play guitar and piano in a town called Hamilton (20 mins from Glasgow). Alan: I recorded the album at home with the aid of my cousin, Colin McGeoch, who is a sound engineer. A lot of people will recognise you as the bass player who wears Converse Chucks with his RHCP stage gear but on this CD, you are playing other instruments… do you have a preference? It’s been interesting concentrating on my guitar and piano parts…and singing of course! 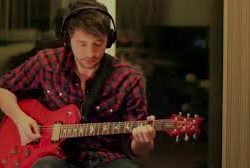 This project has allowed me to explore some music I wouldn’t be able to with RHCP, so I’ve enjoyed the whole writing and recording process and learned lots! 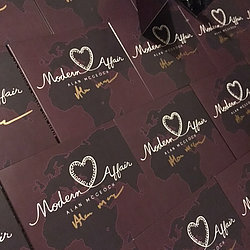 You told me the inspiration for Modern Love Affair was/is exactly that… how did you meet your wife and where is she from? Alan: I met my wife, Calida, on tour in Concord, New Hampshire. We’d meet up every time I was over, then she made a few trips to Scotland and I knew I didn’t want to be apart anymore. We’re actually trying to get her UK visa sorted at the moment which is a very difficult process and not even a guaranteed result. There’s a lot of pressure right now, but we hope she will be able to move over in January/February. Alan: “Four Walls” was written when Calida was living with me as a visitor in Jan and Feb 2016. I have a 1-bedroom apartment that we wrote the song in. The important thing is not the possessions you have, but the company and love within. Alan: “The Distance” was a poem written by Calida which I turned into song using the piano. The message is that the distance between us won’t hold us back. Simple and honest. One of my favourites, and it’s the song that inspired this whole project! Alan: “Scotland Fair” references industrial Glasgow. Was initially going to write a cheery song about Scottish Highlands but decided to give it a darker edge and write about it as a city dweller. The cold, grey, industrial city is all that I knew growing up. Everyone that visits Scotland wants to visit the hills and see the sheep. I want them to see the buildings and the people of Glasgow. The slogan for the city is “People Make Glasgow”. OH, I could use that for my next song I’m writing!! Can you try to summarise the whole recording experience, the story it tells and what it means to you and your wife? Alan: We’re very proud of our “Modern Love Affair” and hope that people enjoy the journey with us…and the music! So there you go… a totally listenable collection of exceptionally well-produced, original material inspired by a modern day love story and available from Alan’s website or at any of the Red Hot Chilli Pipers upcoming shows. I’d like to thank Alan for sharing his thoughts with me and of course, wish him and Calida the very best of everything for their future together.